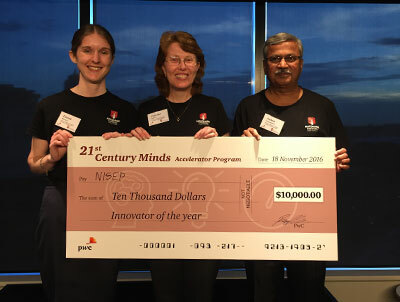 The National Indigenous Science Education Program team was awarded 21CM Innovator of the Year award in Sydney, receiving $10,000 prize money from PwC. Today’s world is fundamentally changing in the face of disruptive innovation, dynamic data and digital technology. Australians must think differently about the skills we need to succeed in the future, and how we can work together to create a capable workforce. PwC believes that no single entity can solve this challenge alone and is working to equip a new generation of problem solvers and innovators to address our future skills challenge. Working in partnership with business, government and educators, we have invested $2.5 million in the 21st Century Minds (21CM) Accelerator program to rapidly scale and accelerate 20 of Australia’s most promising science, technology, engineering and maths (STEM) education initiatives. There’s depth of innovative talent in Australia, but there’s also a need for support to get these initiatives off the ground. We believe that the business community can help nurture and support that talent and that’s why PwC has invested in this program. With the support of the Office of the Chief Scientist, and a number of organisations including Inspiring Australia, Google, Microsoft, NAB and BP, we have helped 20 of Australia’s best social change initiatives to achieve sustainable growth and scale.We’re tremendously excited by all of the initiatives. Any one of them can help to lift STEM education nationally and internationally. The 20 initiatives participating in the 21CM program target preschool children through to university graduates. They include an app that turns playgrounds into STEM exploration spaces, robotics and coding workshops, virtual learning environments, as well as initiatives that incorporate a focus on improving outcomes for underrepresented groups, including women, Indigenous Australians and students from low socio-economic backgrounds. Supporting the program is a network of more than 50 organisations from the government, corporate, education and community sectors, who together, have supported the 20 social change initiatives through an intense and bespoke acceleration process. By leveraging the skills, knowledge, expertise and networks of the community, the 21CM program has successfully amplified the impact of these 20 initiatives. They collectively reach over 150,000 students, 900 teachers and 3,500 schools across Australia. 21CM has also created a network of like-minded organisations and individuals all working towards solving the same social issue. The 21CM program concluded last week, with two fast-paced pitch nights held in Sydney and Melbourne. These showcase events provided each of the initiatives with an opportunity to pitch to an audience of teachers, education leaders and investors with an interest in supporting STEM education in Australia. They have also helped create new relationships and connections to support the network’s continued growth and sustainability. Two initiatives, the National Indigenous Science Education Program (NISEP) and Code the Future, were awarded the 21CM Innovator of the Year award, receiving $10k prize money from PwC. In 2017, two initiatives within the program will also be offered the opportunity to continue working collaboratively with PwC who will invest $500k in services to continue to amplify the scale and impact of their organisations. PwC would like to extend its congratulations and thanks to all those who have participated in this dynamic program – from the hard working and creative people behind each of the STEM education initiatives to the mentors and collaborators from across PwC and the business and academic community. We appreciate all of your input and look forward to seeing where this network goes next. Dr. Chelsea Cobb works in Corporate Responsibility at PwC and is the Director of the 21st Century Minds accelerator program. Inspiring Australia is a collaborator on this STEM accelerator program.